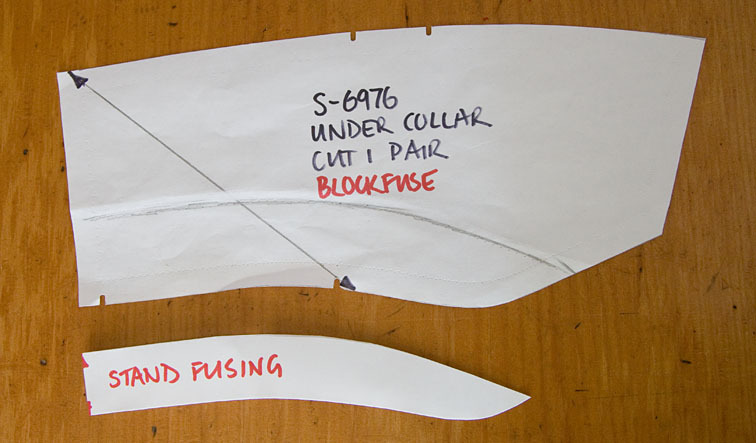 Today we are going to adjust the collar, and make the facings and fusing pieces. 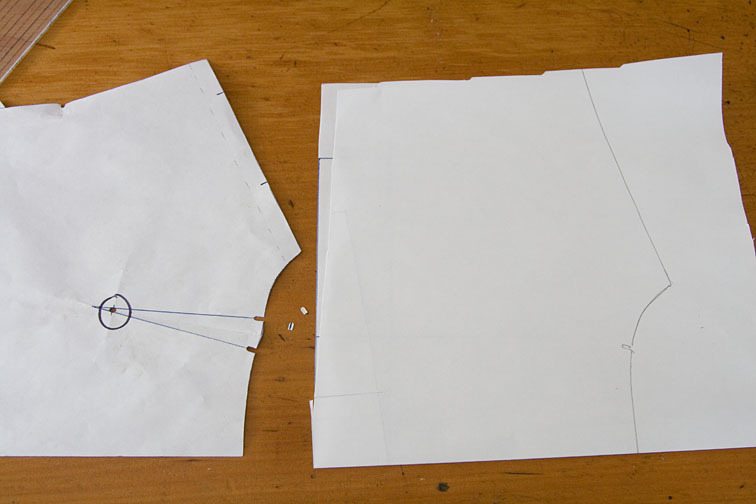 You will need the body and sleeve pieces you cut out yesterday, as well as the Under Collar. 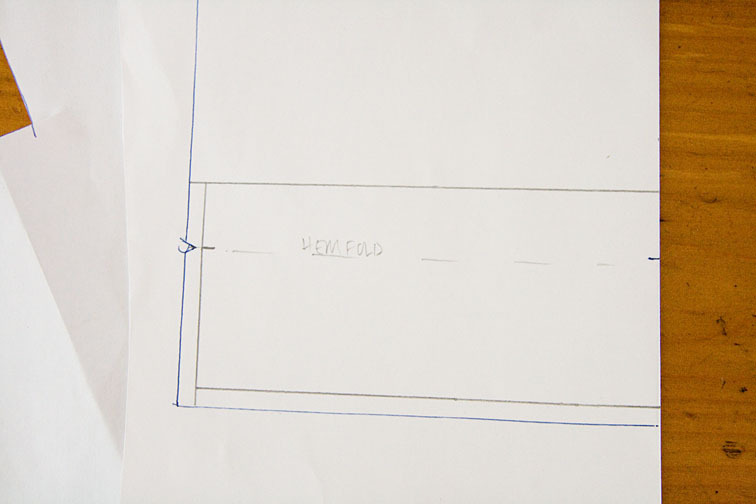 We won’t be needing any of the other pieces so you can file them away in the pattern envelope with your instructions! 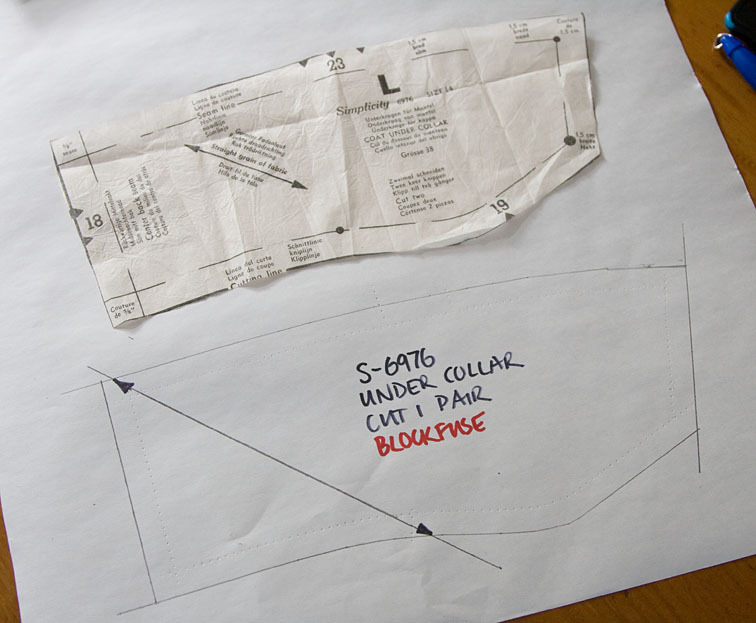 Once again, give your pattern 1cm seam allowances and walk the pattern around the neckline to ensure it fits. 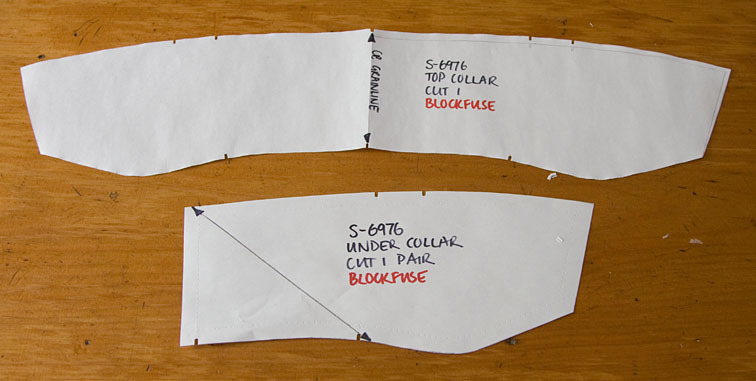 Your existing pattern may or may not have cloth allowance added, but you’ll definitely need to add some to the outer edges of your top collar. The amount added depends on the thickness of your cloth – you’ll need less for a fine wool, and more for a thick coating, about 3-4mm is average. There’s more info on cloth allowance here. We need to add cloth allowance to the lapel edges. From the lapel point, add to the upper edge, tapering to the collar notch. Give this line a slight convex bend – this prevents what I call ‘scoopy lapel’ – which is not a good look. Below the break point, cloth allowance is removed all the way down to the hem. 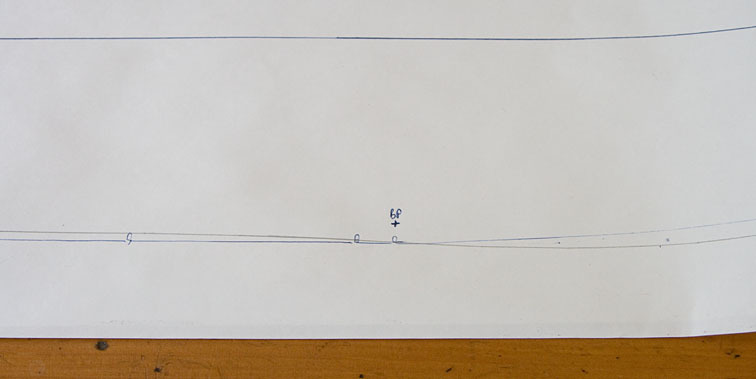 If your front hem edge is curved, remove it right around the curve – as in the example in the cloth allowance post. 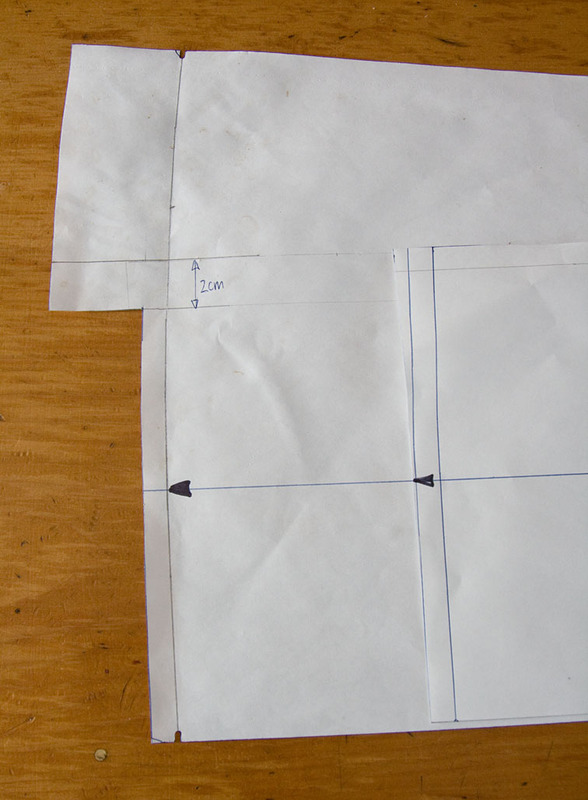 Save the cut away side piece as you will need it to make the front lining! You will need a Back Neck Facing if you don’t already have one, and it is easily made from the Back. There is a neckline dart on my pattern, which I closed out so it is eliminated from the facing. 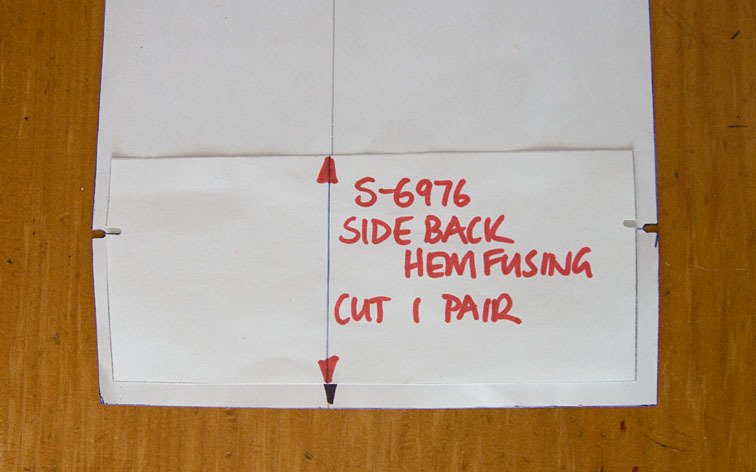 For the Top Sleeve Hem Fusing, and Under Sleeve Hem Fusing, check out this post which shows you where to fuse around the vent. Have you made it this far? I hope so! It all sounds so long-winded in words, but put into practise this doesn’t really take long – a few minutes for each piece, if that. 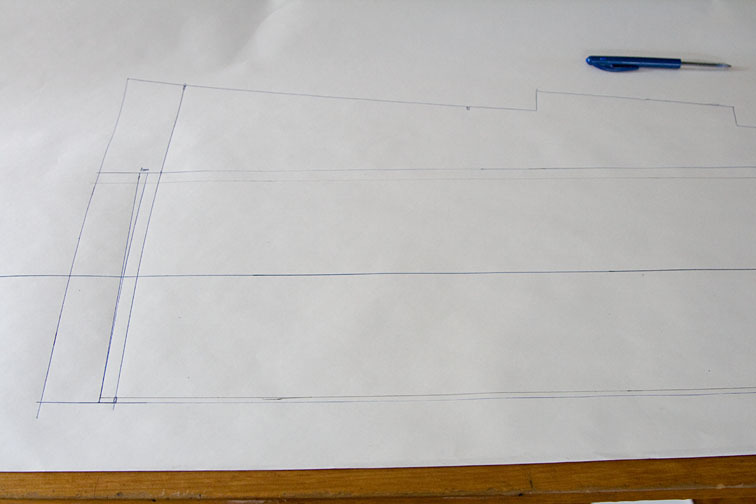 And the time taken will repay itself when it comes to cutting and assembly – I promise! Thank you so much for all the wonderful detail, I am hoping to catch up. Hello! I am not doing the sew along, but I just wanted to thank you already for the wealth of information found here. It reads like a whodunit, is chockfull of information and the tips are exactly what I was looking for in October but will be priceless when I make my next jacket. Sherry, this is awesome! I will really enjoy following along. Wow, you are going fast! I don't think I'll be able to keep up at this rate, I'll have to catch up later. Is there a timeline for your RTW posts? I too am immensely grateful to have this opportunity to learn so much. I too will struggle to keep up with the demands on my time in real life – however, we have the whole winter ahead of us and I'm sure even if I'm a bit slow getting things done at the end of it I'll have a lovely jacket. it seems too good an opportunity to miss. ~Lisa – I think the sewalong will take about a month in total. I'm trying to get these pattern posts up during the weekend, but promise I will leave gaps during the week! 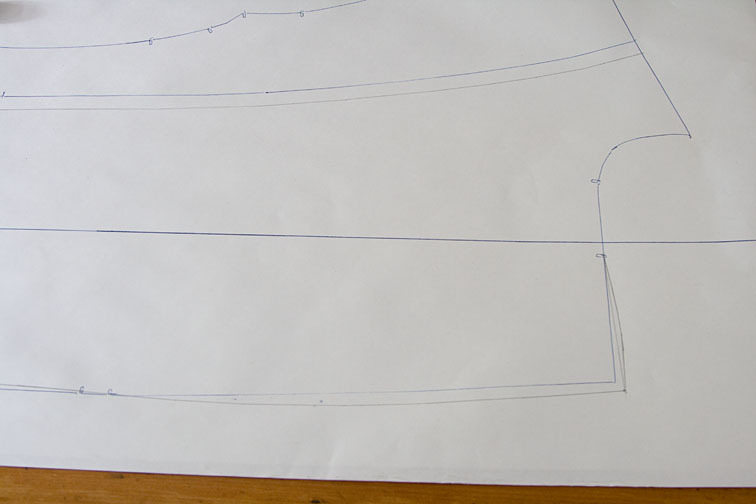 Oooh… I hadn't thought to make my front facings in one piece with no waist seam for de-bulking. Thanks for that. 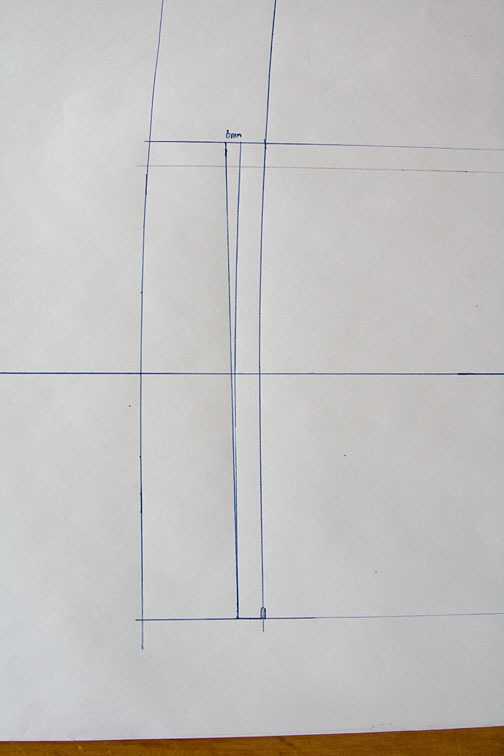 Hello Sherry, I am making a mans overcoat for my son and its a BUrda pattern where they have a separate collar stand cut on the fold for both and interfaced , They also cut the under collar on the fold .I am making this coat out of a heavy wool cashmere coating so its pretty thick . 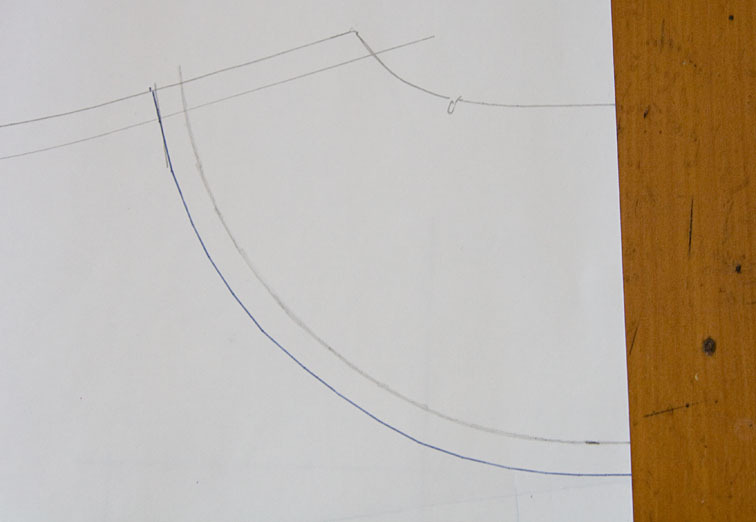 I am thinking that I should cut the under colaar on the bias with a centre back seam and NOT interface it and interface the separte collar stand . Would you cut this on the cross too? Should I interface the upper collar with whisper weft or something less beefy ? Thanks Marianne . PS I havent yet got my photos up . Thanks for your instructions they are EXCELLENT!!!! I would still interface the undercollar Marianne, and would probably cut the collar stand straight. Sorry I'm not familiar what whisper weft is! 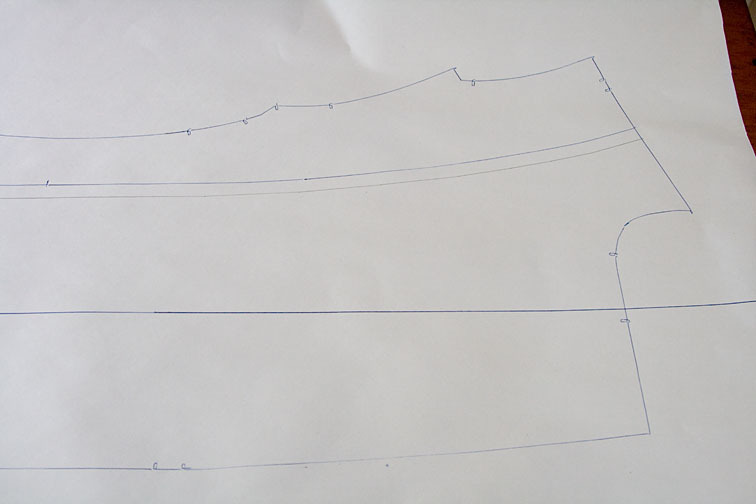 If you are worried about bulk you could grade the seam allowances. Sherry, on the back facing, you say “The facing should be the same width as the front facing at the shoulder seam.” On average, how deep should the center back facing be? ~Jeanette – I usually make mine about 10cm deep, but you could make it the same width as at the shoulder seam if you like, it is personal preference. Check out Tanit-Isis's back neck facing! Love the piped facing. Very cool idea, Tanit-Isis. Hi Sherry, my pattern has a separate collar stand. I assume I blockfuse 2 of them cut on the fold? I checked a RTW jacket I have and the undercollar in on the bias but not the stand. 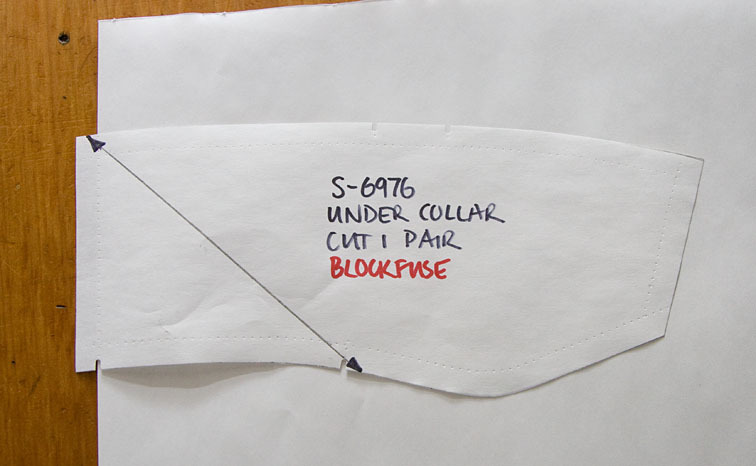 ~Vicki – yes I would blockfuse and cut 2 on the fold, just the under collar part needs to be bias. I'm very behind and working on prepping the pattern. I'm a bit stuck on the front facings, as I have a dart which runs from the collar down the front. 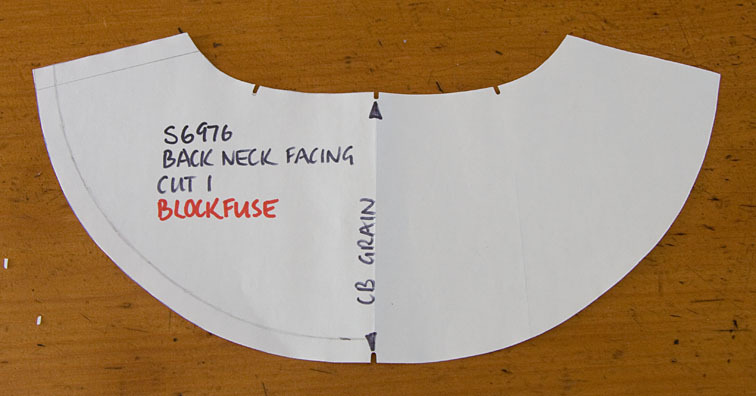 There is also one on the back from the shoulder, which I see you folded out before tracing the back facing. 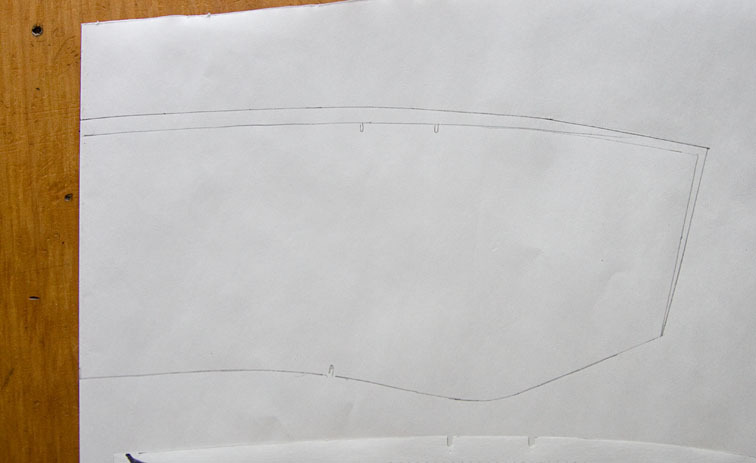 Should I fold the dart out on the front piece too before tracing the facing? The dart is a funny shape, the instructions tell you to cut down the middle of it about 10 cm before bringing the lines together to form it. I've posted a couple of pics on the flickr group for you to look at. Your help would be greatly appreciated. I am intending to catch up this week. Hi daisydonut – if it is what I imagine, it is probably best to leave the front dart in the facing if it is already there. There is possibly a way of eliminating it, but I can't tell without seeing the pattern. 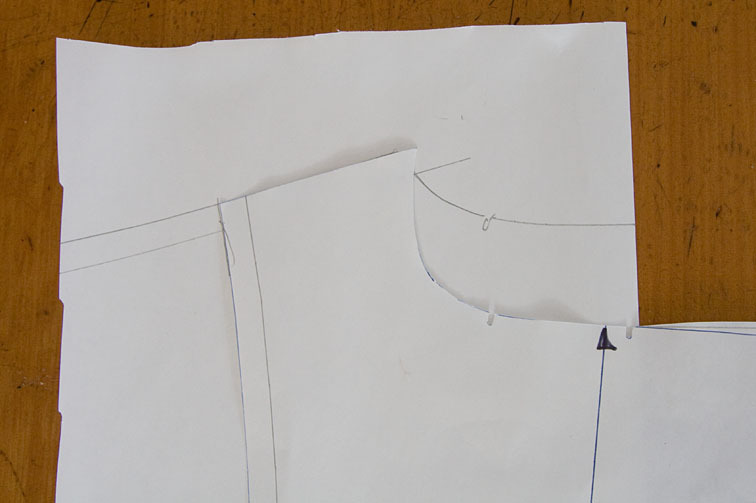 The facing should be square to the shoulder seam, but then it will curve slightly over the bust and straight to the hem, following approximately the lines of the front edge. Is the other line you mention my CF line? Don't forget to allow plenty for the buttonholes! This is amazing ! Thanks so much for posting all of this.